In infancy she hated first diapers, then dolls. Later she hated the school bus, her eagerly smiling teachers, insipid songs about scissor safety, and standing in line for soggy meat and cheese sandwiches she didn’t even want to eat. As an adolescent, she loathed other teens who pretended to hate everything but actually liked: shocking their parents with body piercings, drinking sickly sweet things that made them feel brave but act like cowards, and groping frantically in the back of cars. She hated her parents and the tiny sighs of relief they expelled as they waved, arms around each other, watching the train pull away from the station after she got a scholarship to a faraway Eastern college. They had no other children, of course. While Quinn genuinely despised the earnest way her father chewed his toast in the mornings and her mother’s brisk, cheery: “helloooooo” to every single friend, neighbor, or acquaintance she came across (and there were so many), she was self aware enough to realize that no one who birthed a child like her would be eager to have another go at it. Certainly Quinn realized she was horrible, and she detested herself. But it was with the same dispassionate hatred she regarded grammatically incorrect advertisements, cooing young couples, long hikes in itchy back country to see a view that was going to make her sneer anyway, and smug bicyclists: calves tense, wrists bent, as they careened wildly through traffic. You would think that Quinn’s deeply unpleasant aspect would keep would–be friends and lovers away, but instead it drew them. Anarchists, feminists, and nihilists claimed her for their own as she also hated government, patriarchy, and hope. Her disdain for all food had left her with the long, lean physique of a model, and lovers and friends mistook her air of biting dislike alternating with weary resignation as intensity, romanticism, and a deep need for help and human compassion. This made her irresistible to nearly everyone. She abhorred men and women equally, and she took them to bed without discrimination. She was repulsed by the women’s breathy mewing sounds of arousal and the ridiculous stoic silence of the men. Her own orgasms — sharp, shallow, and undignified — disgusted her. Eventually, she turned away from all companionship and toward her studies, taking a career in science. Here, she thrived. Her equal and unyielding dislike for politics (interpersonal and geopolitical), rats, monkeys, humans, microscopes, telescopes, gloves, and theories made her one of a handful of truly objective scholars, and her reputation and status grew. She hated all of it, of course: the long hours, the accolades, the travel. The hostility and condescension of the men and the attempts at solidarity from the women. The harsh fluorescents of the lab, and later — as she moved to physics — the smell of dry–erase markers. Then, she found it: the perfect equation. Undiscovered, beautiful, balanced; decidedly useful. It would do exactly what she wanted: it would end everything. With no unpleasant wrangling with mechanical engineers or nuclear scientists. It could all end. No more mewling shitting babies in waiting rooms. Socks that slid down her heels. Enthusiastic approval of supposedly spectacular shoes. Chatty strangers on elevators. Using the word ‘utilize’ to sound impressive. Youth symphonies. She discovered with her newfound knowledge that she could now see the warp and weft of the universe: the shining strands that bound everything together. The patterns. The bright place where it was all tied together in a hopelessly simple knot. Another person might have called it beautiful. But she was not another person. With firm, even strokes, Quinn erased the equation from the board so no one else would see it. She walked down the back stairs and waited at the campus shuttle stop as the structure of the world soared with transcendent harmony before her eyes. On the shuttle, she could see the way in which the steel bolts and the handgrips connected with the air around them, gently pushing against gravity. The unspoken communication between the synapses of a young woman looking out of the window and those of the youth next to her. Superimposed over all of it: the couple, the window, the glimmering air, was the equation. It thundered through her mind like the memory of a lover. She gasped at the beauty of it, and with the knowledge that if she used it — the equation, too, would end. But to refrain from implementing an equation of such beauty and usefulness is a horrible crime, she thought, as she stepped off the shuttle that always would stop just a little too far down the track to allow an easy exit. Entering the apartment building she had chosen solely for its proximity to the train, Quinn unlocked the door, hearing the sighing harmony of key in lock, of wood and metal — and stepped into her kitchen. She looked around her home. She should have felt something for it. But she felt no qualms about ending the extra–small appliances, the old peeling vinyl flooring, the unused dishes stacked behind clean glass panes. Even the magnetic radiation that streamed from the microwave: swirling in the thick strands of time, of space, of air and light; were not interesting enough to cause her regret. Quinn’s eyes filled with tears; she shook with raw, unwelcome feeling. She placed her bag on the table and took a deep breath. She would not allow this new emotion to sway her. Quinn readied her hands. Stood in her kitchen on the precipice, paused for a horrible moment; lingering over the shapes and weight of the symbols in her mind. She looked into the dazzling, simple knot holding everything together. Carefully, quickly, before she lost her nerve, Quinn reached out and untied the world. 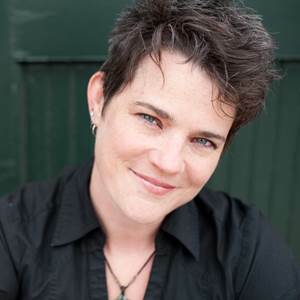 Haddayr Copley–Woods has published dark fantasy and personal essays in places like Strange Horizons, Minnesota Public Radio, Ideomancer, and Year’s Best American Erotica. She’s a freelance writer who lives with her sprawling and strange family in Minneapolis, MN. This is her first science fiction sale and she is ridiculously overjoyed about it. You can find her work at haddayr.com. The fact that this story resists an examination that would generate an equation of literary equivalencies makes it an example of how a perfect story structure reflects what it contains. Well done, Haddayr! LOVE IT. The story itself is perfect! This is beautiful. I love it! Thank you. Very, very cool. And beautifully crafted.